I first saw this image on a comment from Lela on Sanam's MySpace profile, then saw it again moments afterward when Dina sent me a link to a page on the World's Weirdest Animals that also included this very image of a sun bear. I suppose it makes sense, seeing as how sun bears aren't the most-photographed animal in the world. 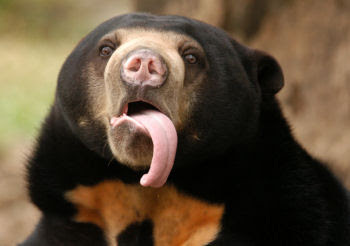 Plus there's the fact that if you wanted to use an image of a sun bear, the above one if, like, the best one ever. Regarding the list of strange animals Dina forwarded to me, she did so with the note that a few of them haven't even showed up on my blog yet. That's true. Specifically, the following purportedly weird animals have already been fawned over here: the red panda, the sloth, the axolotl, the alpaca, the narwhal, the blobfish, the platypus, and, now, the sun bear. That means the World's Weirdest Animals page offers a few new ones worth mentioning. The flapjack octopus, a.k.a. 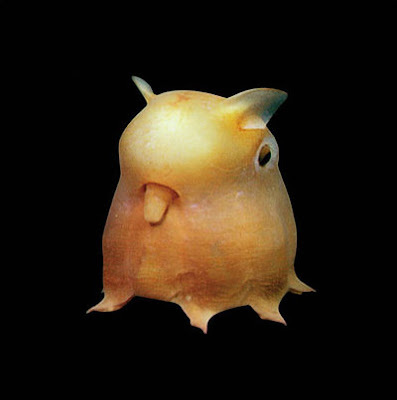 the far-less cute-sounding Opisthoteuthis. 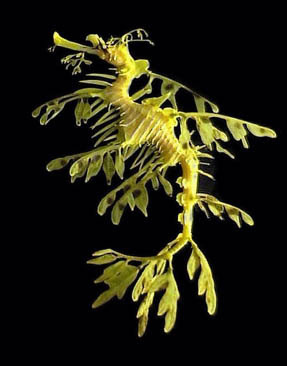 The Leafy Seadragon, a.k.a. the Australian seahorse. 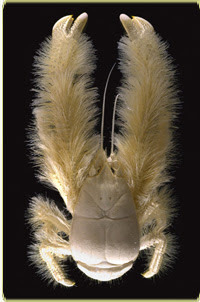 The Yeti crab, a.k.a. kiwa hirsuta. 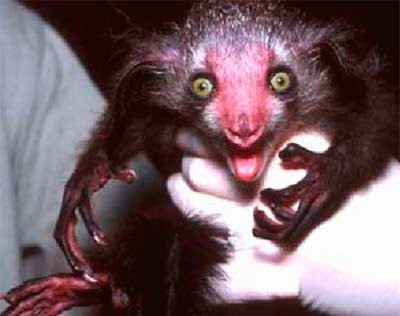 And the Aye-Aye, a.k.a. Omigod-Keep-That-Thing-Away-From-Me. The most noteworthy of this new batch of freaks, at least according to my opinion? It's the guy who graces this t-shirt from McSweeney's. Background info: during a (potentially stoned?) conversation at the Pasado house, Aemon came to the sudden realization that I closely resembled, both in person and character, a young sunbear. I was understandably offended, as sunbears tend to be googly and weird-looking, and this was a source of contention between us all for some time. Hence Lela's comment. Does OPL stand for Old Persian Lady? Nice. May the whole world one day know the wonder that is the Dumbo octopus. I don't think that picture is Grimpoteuthis, I think it's Opisthoteuthis, the flapjack octopus or flapjack devilfish. Opisthoteuthis have very flattened bodies. Grimpoteuthis are not so flattened and have bigger fins. Dude, these are insane. Thanks for the correction. The text has been adjusted accordingly. You are a man of many talents, Mr. Goofy. Or two, at least -- linguistics and octopuses. But that's enough for me. Awesome and terrifying, like all octopus videos.